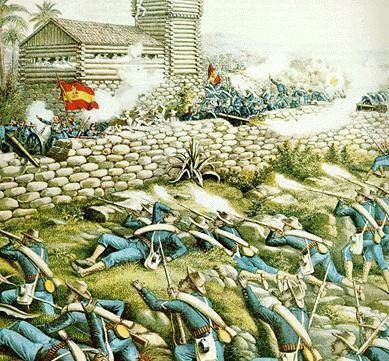 The Battle of San Juan Hill (July 1, 1898) was the bloodiest and most famous battle of the Spanish–American War. It was also one of the greatest victories for the Rough Riders. 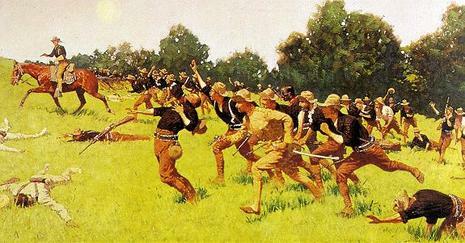 At San Juan Hill, 760 Spanish soldiers were ordered to hold the heights against an American offensive on July 1, 1898. For unclear reasons, Spanish General Arsenio Linares failed to reinforce this position, choosing to hold nearly 10,000 Spanish reserves in the city of Santiago. Spanish hilltop entrenchments, while typically well-constructed, had been poorly positioned, which would make even point-blank rifle volleying at the advancing Americans difficult. General William Rufus Shafter commanded about 15,000 troops in three divisions. Jacob F. Kent commanded the 1st Division, Henry W. Lawton commanded the 2nd Division, and Joseph Wheeler commanded the dismounted Cavalry Division but was suffering from fever and had to turn over command to General Samuel S. Sumner. Shafter's plans to attack Santiago de Cuba called for Lawton's division to move north and reduce the Spanish stronghold at El Caney, which was to take about 2 hours then join with the rest of the troops for the attack on the San Juan Heights. The remaining two divisions would move directly against San Juan Hill with Sumner in the center and Kent to the south. 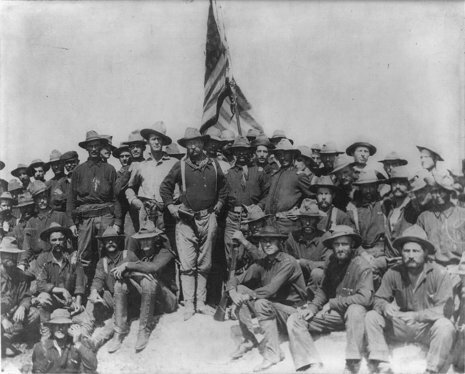 Shafter was too ill to personally direct the operations and instead set up his headquarters at El Pozo two miles (3 km) from San Juan Hill and communicated through mounted staff officers. The cavalrymen then turned their attention to the line of trenches to their right front, to which the Spaniards had fled from San Juan Hill. Roosevelt charged. After advancing 100 yards with only five men, he turned around, ran back and scolded the rest for not following. They innocently replied that they had not heard his order. 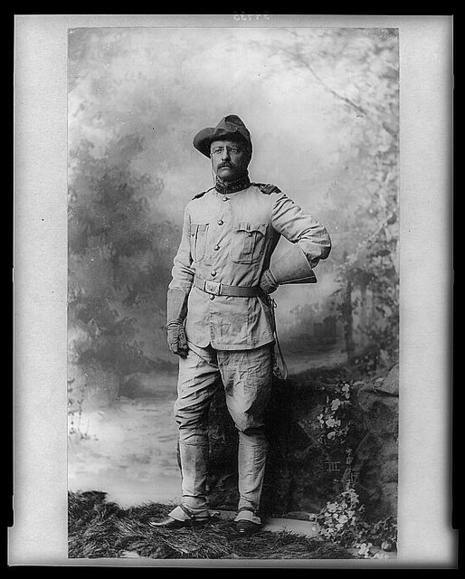 Roosevelt turned to Sumner for permission to lead the other regiments in the attack. The general assured him that the men would follow.